Et voilà! 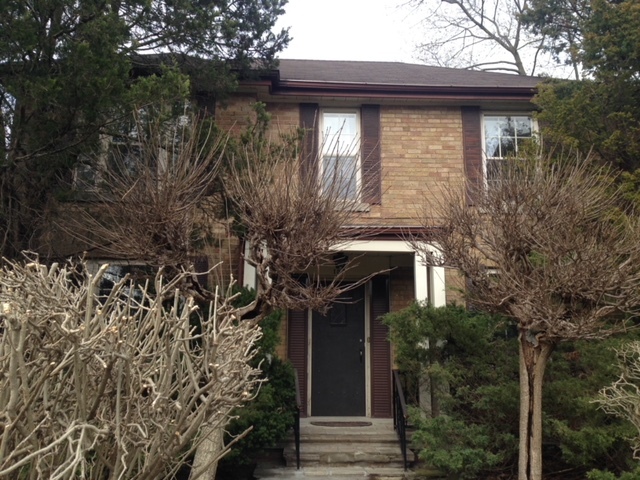 Please welcome our newest member of the Caledon Build family: 102 Leacrest Road. 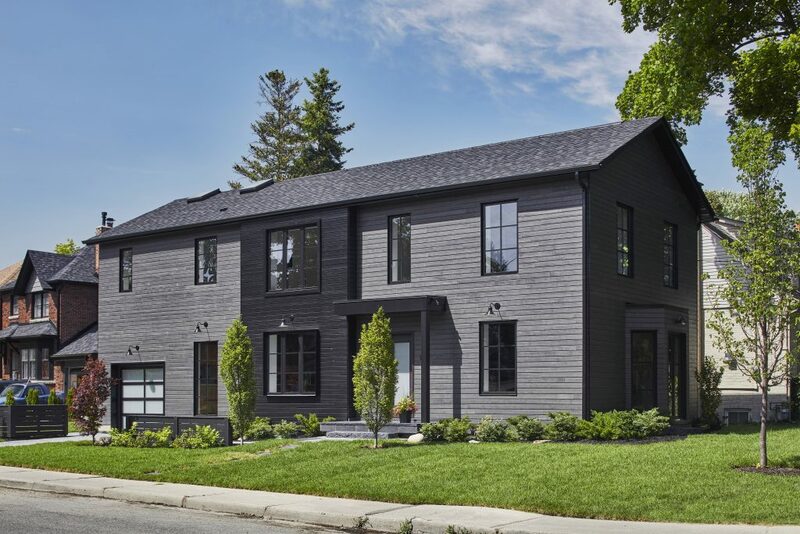 This recently completed fully detached home was built in Toronto’s coveted Leaside neighbourhood. Tell us about the design and overall vision for the home. The inspiration for the home was the classic barn, which you typically see in the countryside. We wanted to maintain the classic barn shape while making it more contemporary and minimalist, with the emphasis on clean lines and simplicity. As for the inside, I wanted the design of the house to be centred around a family lifestyle, which is something important to me. The open concept on the main floor allows a family to be together. This was how I was brought up in France. As a little girl, I did my homework in the kitchen area while my parents made dinner and talked about their day. We all sat down together for every meal, chatted and had a nice time together and that’s what I think about when I design a home. It is also easy to entertain friends and family in this house which is another important element I always consider when I work on the space planning. What are some of the most unique features of the home? 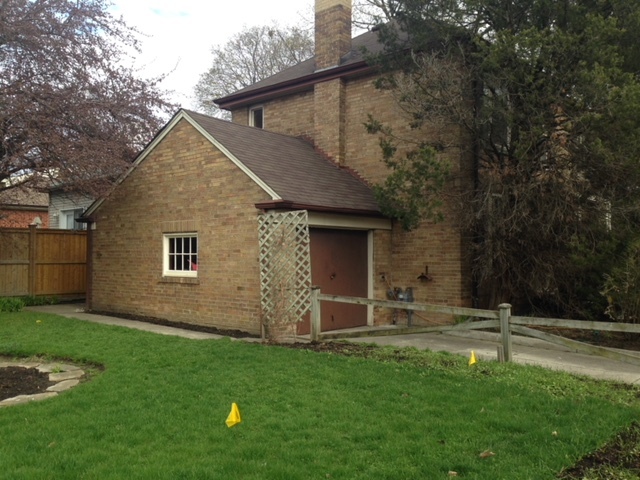 I would say the dark wood siding on the outside is a pretty striking feature. 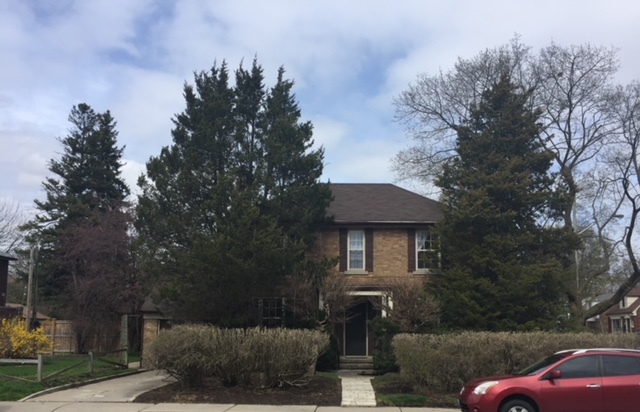 There are very few black houses in Toronto and every time I see one, I just think that they add so much to their surroundings. The wood siding was brought in from Quebec and it is a truly unique architectural element. 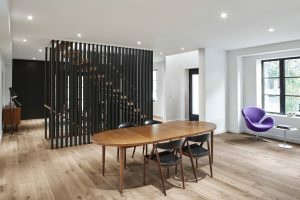 Inside the home, the most unique feature is the staircase. An architectural focal point of the home no doubt as it is the first thing you see when you walk in. Patrick Skuce and I worked closely together on the design. I wanted the staircase to also act like a divider or screen between the living room and the kitchen/dining room. 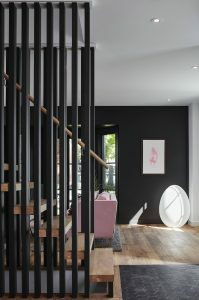 The staircase is made out of 2×4 white oak wood “pickets” or “slats” which we stained black. 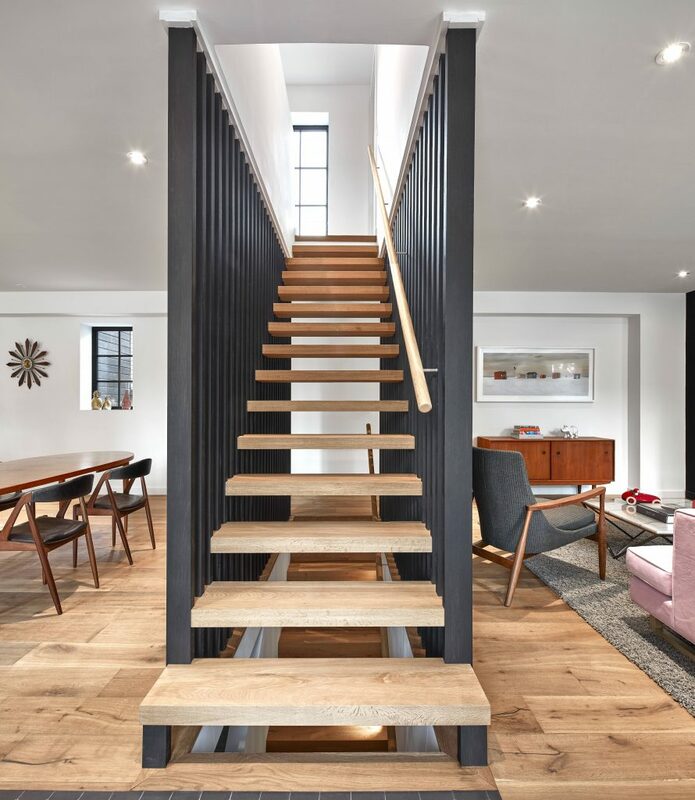 The design is quite complicated as there is no central stringer; the treads (made out of solid white oak left natural) are basically secured to the slats (which are also secured at the ceiling and in the floor) giving the impression that the stairs are floating. The handrail is a white oak wooden dowel that was also kept natural. What is your favourite room of the house? The modern kitchen is one of my favourites as it plays a central role in the open concept idea. I love to cook and I wanted the kitchen to be one of the most important features of the house. It had to be practical and look modern, yet inviting. The kitchen was made in Italy. We used a mix of white oak and black matte lacquer for the cabinets on the long wall with a complimenting white oak island/breakfast bar. We made sure we had plenty of storage, including upper cabinets, storage in the island, big drawers for pots and pans, and a pull-out pantry. The fridge and dishwasher are completely integrated which gives a tailored and elegant look. The countertops are quartz, providing a durable working surface that is easy to clean and maintain. 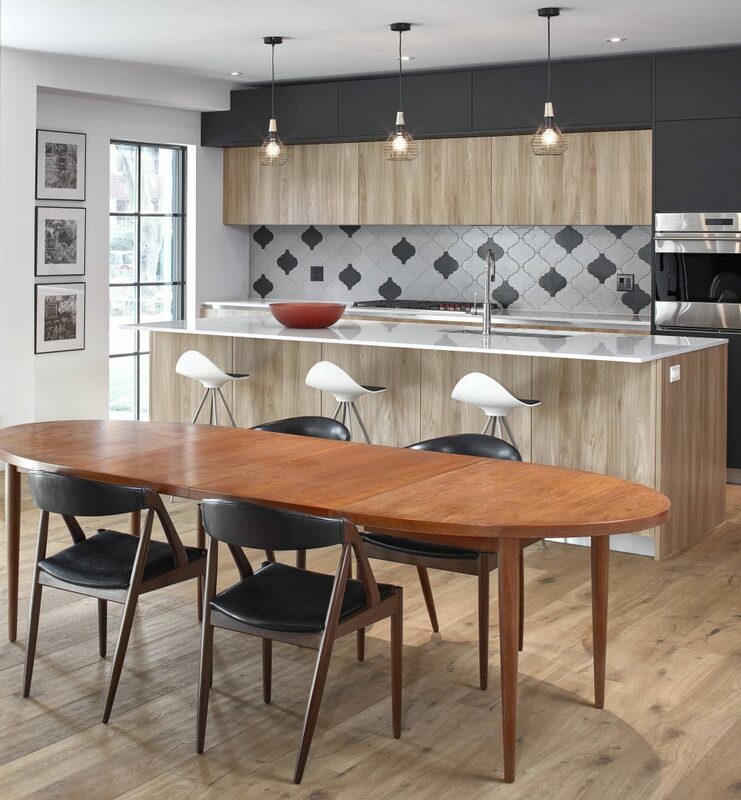 The flooring is engineered hardwood flooring that is duplicated throughout most of the house creating a seamless connection to the open concept space. For more information on Leacrest, click here. Nathalie Thorel, owner of Interior Affairs, has been an interior designer for 11 years. 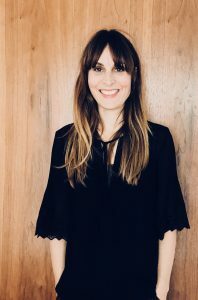 Born and raised in France, and now established in Toronto, Nathalie draws her inspiration from her French classical background and her love of everything modern. Her projects reflect a combination of minimalism and cool, edgy elegance often combining traditional French decorative elements in a contemporary way. She works with a wide selection of natural materials and a soft colour palette to create serene and chic interiors.